Sure it was red all over Gaza this year, and earlier than any other country in the world, blood red, not rose red. The Independent published an article today entitled Israel allows Valentine carnations out of Gaza. The Independent reporter described Israel’s allowing 25,000 carnations to cross the border in the first exports permitted from blockaded Gaza in a year as a gesture. Is this funny or what? Usually the expression gesture holds meanings of good will and kind intentions or so I thought, since gestures usually do not come after killing the people and bulldozing their homes to the ground as well as creating orphans and widows. 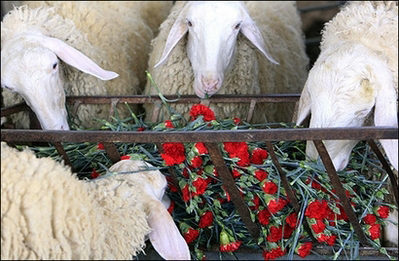 Good old Israel allowed 25,000 carnations from Gaza to cross the border so that the lovers in Israel and Europe will have a day to remember, but kept the medicine and children’s food under siege for 19 months. What a gesture… Oh I have forgotten that Palestinian children are not worthy of mercy or consideration, unlike the sensitive Europeans who should celebrate Valentine’s Day in style. I bet those carnations are the most expensive in the whole wide world since they grew in Palestine and were irrigated with blood. But thank God the Independent reporter assured us that Major Peter Lerner, of the military’s civil co-ordination office, said Israel had agreed to relax the blockade for the carnations at the request of the Dutch government. I wonder how come no government in the west succeeded in its requests of Israel to relax the blockade for children’s food and medicine and how come only Valentine’s Day flowers had this privilege. One more question comes in mind, how come the children of Gaza were harvested by white phosphorus bombs while the carnations of St Valentine remained untouched…the irony that the people who are mourning their loved ones, are the ones who are growing the roses and carnations that will be enjoyed by the civilized part of the world, civilized to the point of creating weapons and watching the children of those who plant those flowers die of starvation and be burned by the bombs. To all the Palestinian women who have lost their loved ones, may you rise up like olive trees and keep your roots in the soil… you deserve all the roses in the world. It`s a crime and it`s still going on. in our daily living. So sad that “they” had to make a “valentine” day only to ensure that “love” will not be extinguished from their existence. that had its valiant sons die for the ungrateful Palestinian Muslims. I as a Palestinian MUSLIM tell you try to fish for trouble somewhere else. I never made any propaganda to Hamas and I never mentioned it ….read well…that if you really do. second point this article has nothing to do with 1970 or king Hussein… I can smell a plant and I got used to this kind of intimidation. Regarding Egypt I never attacked its people what are you trying to do here? Jordan….Egypt….Christians….Hamas???? Play somewhere else….this is an amateur attempt to stir hatered and inject your poisons from behind a screen.